Abstract: Few industries left in the world will accept a status quo that does not embrace the benefits and advancements of electrification in today’s digital age. But with a mind-boggling and complex array of sensors, controllers, data, etc., how can the fluid power industry best benefit from electrification? 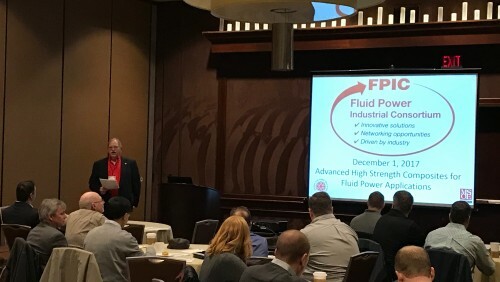 We will discuss a simple yet powerful method of direct fluid power control that utilizes a fixed displacement pump and bi-directional motor to best capitalize on, and reap the benefits of, the latest electronic technologies. This “smart pump” type system allows for intelligent and adaptive control techniques as wells as functionality and performance never seen in fluid power systems. Case studies of several applications of this technology will give a solid overview of how implementation can provide numerous benefits as well as the challenges that can be encountered. Abstract: Implementing electro-pneumatic valve manifolds in future industrial automation systems provides modularity, flexibility and cost savings. Open industrial network standard compliance offers many configuration and integration options. Wireless manifolds allow greater flexibility in the machine’s mechanical design. This intelligent system is prepared to be part of a larger IIoT system with maintenance free communications, minimal machine downtime, and maximum use of the data currently being collected. Abstract: Telematics are becoming increasingly popular in off-highway equipment. Today, the technological barriers are quite low and sophisticated implementations are no longer limited to the largest OEMs. There are a wide range of available devices and use cases. Simple GPS trackers can provide a fleet manager with the location of all his assets. More complex trackers might also provide feedback of ubiquitous J1939 data like engine hours, engine rpm, and vehicle speed. Several widely available devices can even be programmed to provide feedback and control of the proprietary portion of the vehicle network. These capabilities improve an OEMs ability to do new product development, process optimization, and user training. This presentation will discuss several of these diverse use cases. Join us for lunch and continue the discussion with your FPIC colleagues. Don't miss out on attending our March 1st program.